On Star Trek: Voyager, Kate Mulgrew made history as the first female captain on a Star Trek TV show, Captain Kathryn Janeway. But she wasn't the first choice. The original choice for the lead role was Canadian French actress Geneviève Bujold as Captain Nicole Janeway. Bujold only filmed for two days before quitting or being fired (depending on who's telling the story). Everyone agrees that Bujold, who had previously acted only in movies, wasn't up to filming a TV show. Producer Rick Berman later said Bujold "was a woman, who in no way, was going to be able to deal with the rigors of episodic television." According to rumors, she had trouble memorizing pages of dialogue every day, didn't want her hair touched up on set by hair dressers, didn't like the director, and found the eighteen hour work days exhausting. On the other side, director Winrich Kolbe grew frustrated by Bujold's restrained performance as Janeway, wanting her to play the role with more power. 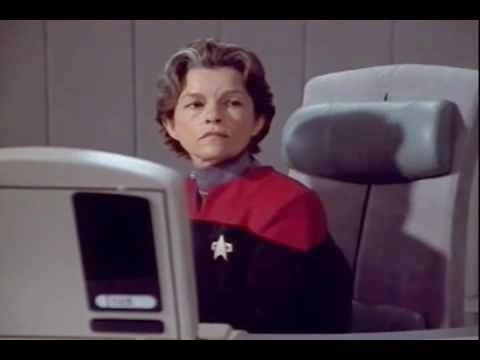 Anyone who watches the completed footage of Geneviève Bujold as Captain Nicole Janeway will see she would have played a very different version of the iconic heroine. YouTuber aobadger created a segment of her filming "with added VFX and sound to give a full idea of how this scene would have looked if edited into [the pilot episode] 'Caretaker.'" What do you think of the original Janeway? Update: This post originally said Bujold was French. It's been updated to show she's Canadian. She is a little too staid in that clip. Would have been like watching The Motion Picture as a series. That would be a "NOPE". Kate Mulgrew is the only one for me. I'm glad they went with Kate Mulgrew. As a ship's Commanding Officer, she appears to be about as capable as that hatrack over in the corner . . .
Kate Mulgrew was not the best captain in the franchise & her chin is simply "too much" :D But she did a decent job, given the hard task she had as the first female lead character in charge in the franchise.